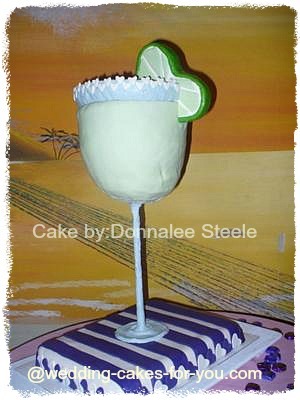 Margarita cake for a bridal shower...I was asked to design a cake for a friend which resembled the invitation. The theme was margaritas and the shower was held at a Mexican restaurant. My husband and I were up all night rolling fondant, making heart cut-outs, rice krispie treats...you name it. The bottom part is a chocolate chip pound recipe. The stem of the glass is steel rod. The glass is made from a vanilla pound recipe and support structures were added. 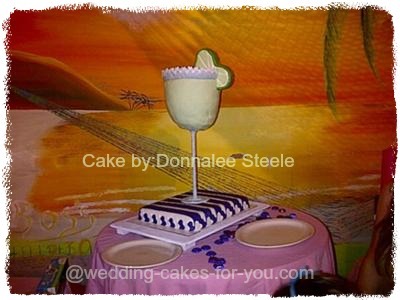 The heart-shaped lime and the rim of the glass were made from rice krispy treats and then covered (along with the stem) with white modeling chocolate. Everyone loved it and my husband and I are so proud of this challenging cake we finished!! Donnalee - Outstanding! Your bride must have been very happy with your margarita design. 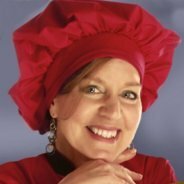 Thanks for entering the contest! Good luck. 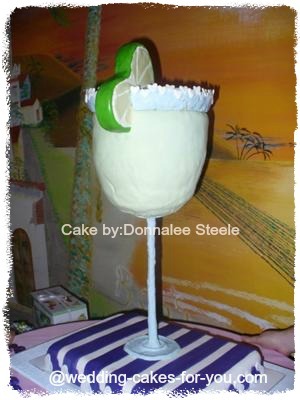 Love the margarita cake. 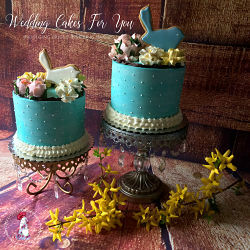 Especially for a summer wedding! This cake looks great! Good Job Donnalee! Looks good enough to drink! I am the maid of honor for this wedding. Couldn't have asked for a better cake to match the shower theme. 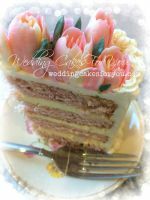 The cake looked exactly how we expected and tasted even better! the bride loved it! 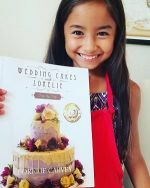 Amazing job, Donnalee! I am so amazed and proud of you. After seeing this cake and all the beautiful details you put into it, makes me realize just how truly talented you are! Watch out competition because she is just getting started! This took a lot of innovation to create a cake that looks like it's defying gravity! Excellent! The highlight of my shower! I'm the lucky bride that Donnalee worked all night making this cake for!! Not only did it look amazing, but it tasted fantastic! It was the highlight of the shower and Donnalee deserves to win!!! Thanks so much Donnalee!!!! 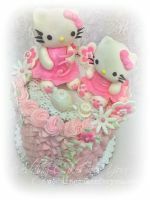 Donnalee makes the best cakes - not only are they original and beautifully decorated, but they are so delicious! Awesome cake Dlee...I was so impressed. You're so creative and talented!!!! 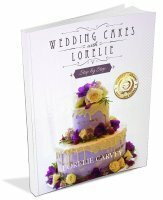 5 stars for a cake-beautiful and -delicioso! It makes the mother of the groom proud.